It’s only a few weeks now ’til A Dog’s Life hits bookstores, so I thought I’d share a little taster of one of the stories from the book. Bruno takes his role as Rafting New Zealand’s mascot seriously — he always insists on the best seat at the front of the bus on the way to the river, and he is always front and centre on the raft. 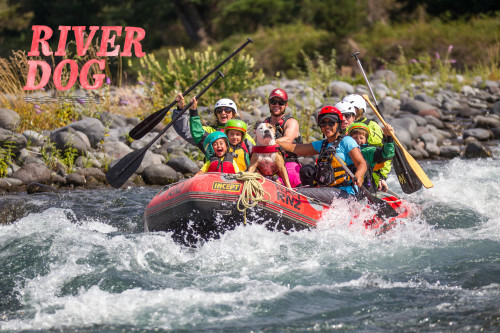 Luke and Pianika’s four-year-old daughter Blaise loves to go out rafting, especially when Bruno goes with them. Blaise is allowed to raft only on lower-grade rapids, while Bruno, a seasoned pro, has quite often enjoyed the thrill of the tumultuous waters of a grade 4 river. Adventurous dog that he is, Bruno has been rafting all over New Zealand, including trips on the Ngaruroro and Mohaka Rivers in Hawke’s Bay. The only drawback to those trips was the short helicopter ride in each case to get to the river. Air travel is not for Bruno as he tends to throw up in the helicopter. But as soon as he sees his jacket, especially imported for him from the United States and equipped with a handle for a bit of extra safety, he is his usual keen self. Now 10 years old, Bruno doesn’t go out rafting as often as he used to, but when he sees his life jacket come out of the cupboard, he still gets excited. Read Bruno’s full story in A Dog’s Life. For every pre-order of A Dog’s Life I receive, I’ll be donating $1 to K9 Rescue and Rehoming. Pre-order your copy now!